What is Low Carbon Homes? 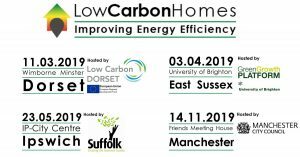 Low Carbon Homes brings global domestic energy efficiency innovation to the UK’s regions via a nationwide event series – the Low Carbon Homes Forum. Low Carbon Homes wants to drive the adoption of new energy-saving standards in the UK’s aged housing stock by providing a unique platform. Here, professionals can share best practice and discover pioneering methodologies and products to help transform home efficiency, reduce fuel poverty and lower carbon emissions. The Low Carbon Homes Forums provide success stories and case-studies in a free-to-attend collaborative workshop-style environment. Each event will be tailored to address regional issues guided by knowledgeable host partners. By facilitating knowledge exchange, peer-to-peer learning and de-bunking myths, the events help to reduce barriers and accelerate the take-up of energy efficiency best practice in each region. There are four Forums planned for 2019, each partnering with a key regional low carbon champion. Featuring a programme including respected representatives from national and local clean-tech companies, low-carbon advocates and industry associations, each Forum provides a valuable opportunity for knowledge exchange, collaboration and networking. Each one-day Forum provides a fast-paced, participative experience, with interaction between attending professions encouraged. Technical workshops follow the morning plenary sessions, while local SME’s showcase their solutions in the Supply Chain Expo. Following a successful 2018 collaboration in the creation and delivery of Low Carbon Homes Forum South West, The Green Register will once again play a vital role in the expanded 2019 event schedule. With an emphasis on the Fabric First approach long advocated by The Green Register, Lucy Pedler and Dan Weisselberg between them will chair proceedings, foster discussion and host a workshop while being a “critical friend” throughout the programme development for each Forum. Who are the Forums aimed at? Architects, Engineers, Consultants, LA Officers and Councillors, Energy Assessors, Asset Managers, Academics and other professionals working in this space. Forums are free-to-attend for invited professionals.